Rice goes through a variety of processes before it reaches the consumer. After harvesting, the husk of the rice is removed by milling process which gives you the brown rice. The process that produces brown rice removes only the outermost layer, the hull, of the rice kernel and is the least damaging to its nutritional value. 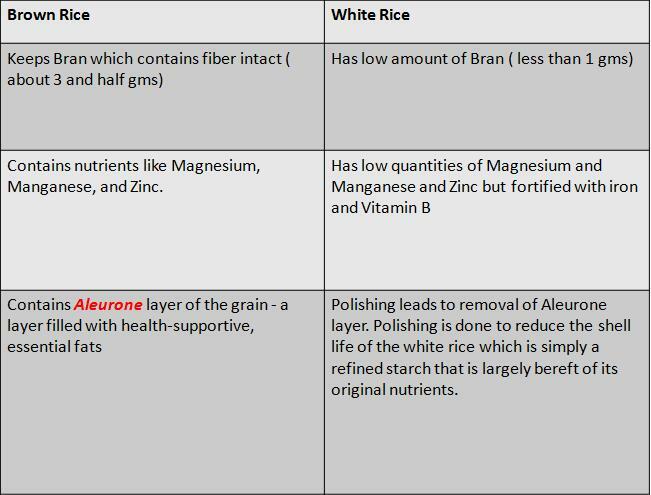 The complete milling and polishing that converts brown rice into white rice destroys 67% of the vitamin B3, 80% of the Vitamin B1, 90% of the Vitamin B6, half of the Manganese, half of the Phosphorus, 60% of the Iron, and all of the dietary fiber and essential fatty acids. Reduce Your Risk of Metabolic Syndrome. For more info on how we can help you reduce weight and lead a fit life , visit : http://www.bodyfuelz.com or call our toll free number 1800-200-4500 . This entry was posted on September 28, 2009 at 10:09 am and filed under AMINONUTRITION,Carnitine,health and fitness,health in office,life,Lifestyle,Nutrition,protein supplements,Weight loss. You can follow any responses to this entry through the RSS feed.